I’ve been obsessed with distance casting since my childhood. I couldn’t wait until I got 14, as in Hungary only people above this age are allowed to do bottom fishing. As years went by, I kept asking myself the question: How can I cast further? I often went to a nearby quarry lake in Csepel with my friend, Józsi Brunner. After school, we spent every weekend on the lake, and competed with each other in casting further and more punctually. Our buoy got further and further and, as a result, we caught magnificent carp and grass carp in the areas that the other anglers couldn’t reach. Of course, distance casting is not always the way to go. Quite often, you can catch the biggest fish near the shore, “under your legs”. However, long casts are definitely useful, because you can extend the area that you can fish. We made the first feeder rod casting test with Gábor Döme in 2008. Back then my longest cast was 149 meters with a 450 cm-long rod and 0,20 mm main line. The next occasion was at the first Carp Show. I was invited to the event present distance casting. A few years passed, and in 2016 I decided to make a distance casting video. The angling tackle and my casting technique had improved a lot. 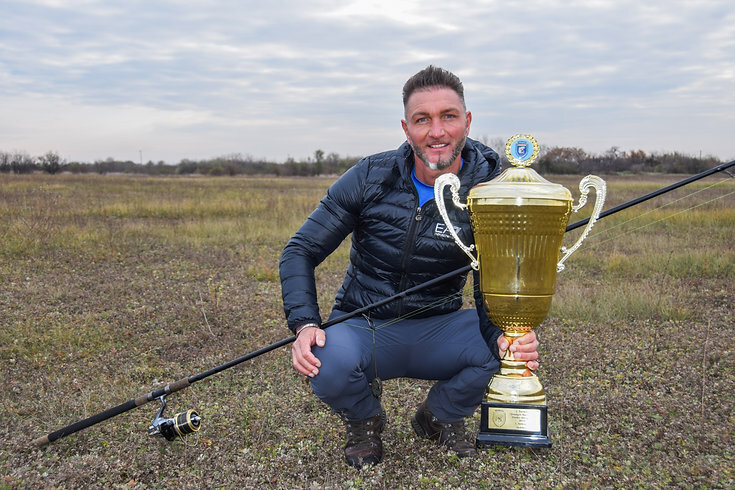 During the shooting of the film I managed to achieve 178 meters with 0,18 mm main line and a loaded feeder basket that weighed 130-140 g.
In this year, the Hungarian Fishing Association organized the first national distance casting championship. There were two categories “boilie” and “feeder”. I chose the “feeder” category, and I convinced my friend, Zoli Reményi and Szabi Béres from FEEDERMANIA team to take part in the championship. We’d started our preparation together 1,5 months before the competition. We were practicing with Zoli on a meadow not far from us, while Zoli was casting in the eastern part of the country. We talked on the phone every day and analyzed hundreds of videos, trying to examine foreign distance casting stars’ techniques. We practiced in calm weather. This was important, because we wanted to get a realistic picture of our technique and tackle. We often went out during the night. I noticed that you can improve a lot at night, because you focus only on casting itself. The rules of the competition were fairly strict. 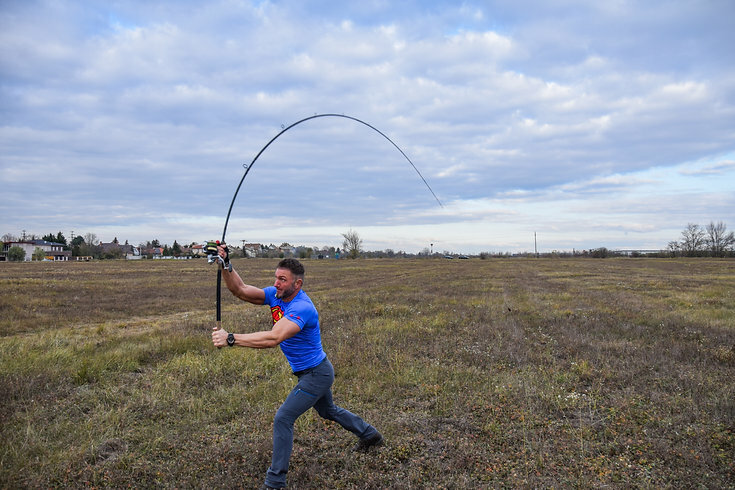 The maximum length of the fishing rod was 430 cm, which prevented the competitors from using the best distance casting rods. I couldn’t use the rod with which I achieved my best results. The weight of the loaded feeder basket couldn’t exceed 100 g, which seemed to be a little light as I had achieved my best casts with 140 g feeder baskets. Furthermore, we were not allowed to use main lines thinner than 0,18 mm. When setting up our tackle, we took into consideration all these rules. I’d tried 6 rods until I found the best one, a Manta Evo-XT 420 XXH feeder rod. 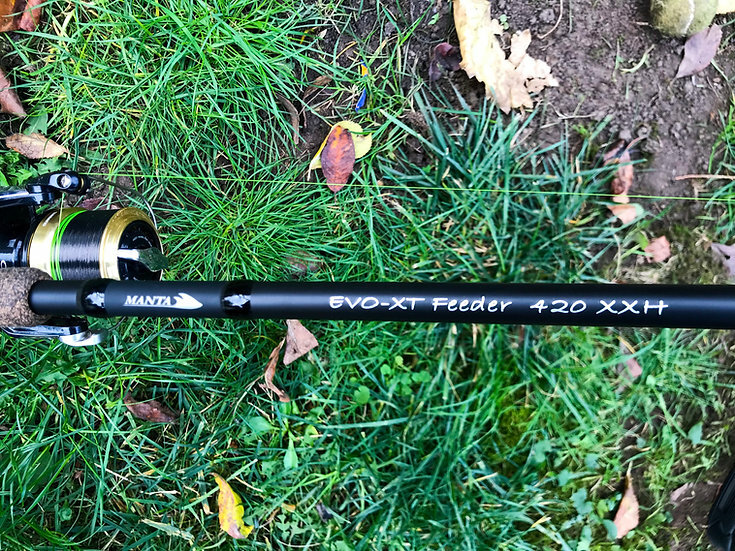 Manta Evo-xt 420 xxh feeder became my favorite rod during the tests. You can reach enormous distances with it. Yet, it’s still flexible enough when you’re playing the fish. I think rigid rods fit my casting technique. The Evo-xt is fairly rigid, but it’s also quite flexible, therefore I achieved great distances with it. When it comes to reels, we prefer size 5500 reels from the Shimano Ultegra series, because their spools work in harmony with the size of the guides. I chose the 0,26 Daiwa tournament evo braid for leader. It is a strong braided line, but also very soft. Long casts put a lot of strain on the line, so I used a 0,26 mm braided leader. The fluo color will be compulsory from next year. I chose a 0,195 mm thick main line, because the thinner ones broke quite often when the knot of the leader hit the guides. They could not stand the force. From the feeder baskets, which weighed 100 g when they were loaded, the flat method with a lead proved to be the best. During the tests, long leads were not necessary. An 8-cm-long lead was enough to stabilize the feeder. Interestingly enough, I managed to cast over 180 m with this set I just described. This was a great surprise as I used a shorter rod and lighter feeder than the ones in the distance casting film. Fortunately, however, I prepared a good setup and probably my casting technique had also improved. I had 1,5 months until the competition. During this time, I had to stabilize my casts to be able to do my best under all circumstances. Of course, I tried some techniques performed by foreign anglers, especially the one where you step in from the side, but in such short period, I couldn’t acquire this technique. My casts were not punctual, and I didn’t want invalid casts in the competition. So, I used my old technique. The rod was above my head and I stepped forward when casting. I did change two things, though, which helped me gain a few extra meters. Firstly, I made a bigger step forward dynamically. This made my arm which was holding the rod bend a bit. Therefore, during casting I also pushed the rod. Secondly, I usually grip the line to the foot of the reel with my index finger before casting. However, what I’ve learnt from the films is that all 3 or 4 fingers should be above the foot of the reel, because in this way the reel’s center of gravity goes back, which makes the rod faster. Whereas Szabi could find the right technique pretty soon, Zoli was down in the dumps two days before the competition. Finally, he also succeeded with the help of my friend, András Greznár. So much so that Zoli was awarded the third prize in the championship with 171,5 m. For me, the competition started pretty badly. It turned out a few days before the championship that I was not allowed to use my Manta Evo xt, because there was only one piece available from it. I specifically asked this question from the organizers and their answer was as I expected. I think this was a fair decision, because everybody should use a rod that’s available for the other anglers too. After the organizers’ decision, I chose a rod with a very similar action, but unfortunately its tip was shaking when I waved it. The knot of the leader hit the guides and my line broke after my first cast. The remaining two casts had to be successful if I wanted to achieve results, so I decided to use a more rigid, but heavy feeder rod. This rod was a bit more difficult to wave because of its weight, but it prevented the line from breaking. Although the distances I reached with this rod were 5 m shorter in average, but after the first cast I just couldn’t risk it. Robi Végh helped me with the knot of the leader too. Either the knot or the change of rod, but my next two casts were successful. I managed to reach 186,78 m and 183,77 m, so I won the competition with an average distance of 185,275 m, thus, I became a national champion. But the casts had not finished yet. One of the competitors wanted to take part in the championship with a feeder rod from which only one was available on the day of the competition. Although the organizers did not allow the angler to use the rod, on request of the manufacturer, they promised to officially measure 3 casts. After Gyuri Fiola, who was awarded second the prize in the feeder category, I was also asked to cast twice with the rod. First, I reached 189,90 m, whereas my second cast was 190,99 m. With my second distance I’ve broken the official feeder record. I was extremely happy as besides my national champion title, now I’m also a world record holder. What’s more, three out of four places were won by FEEDERMANIA team members. Szabi could manage to get the fourth place and Zoli could improve more than 30 m between the first practice and the day of the competition. His example, I think, tells us that it’s worth trying, because sometimes you do need to cast long.